A new breed of cyberattack is emerging into the threat landscape, fuelled by geopolitical tension, there has been a rise in stealthy and sophisticated cyber attacks reported within recent industry reports. 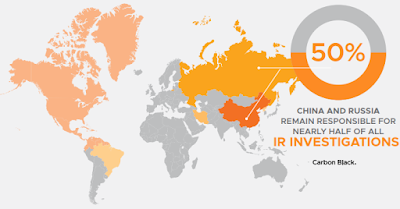 Carbon Blacks 2019 Global Threat Report, released on Wednesday (23/1/19), concluded global governments experienced an increase in cyberattacks during 2018 stemming from Russia, China and North Korea, while nearly 60% of all attacks involved lateral movement. ‘Lateral Movement’ is where an attacker progressively and stealthy moves through a victim’s network as to find their targets, which are typically datasets or critical assets. This is an attack of sophistication, requiring skill, resources and persistence, beyond the interest of average criminal hackers, whom go after the lowest hanging fruit for an easier financial return. Carbon Black concluded that as 2018 came to a close, China and Russia were responsible for nearly half of all cyberattacks they detected. The US and UK government agencies have publicly articulated their distrust of Chinese tech giant Huawei, which resulted in BT removing Huawei IT kit from their new 5G and existing 4G networks last month. UK Defence Secretary Gavin Williamson said he had “very deep concerns” about Huawei being involved with the new UK mobile network due to security concerns. At end of 2017 the UK National Cyber Security Centre warned government agencies against using Kaspersky’s products and services, which followed a ban by the US government. Barclays responded by removing their free offering of Kaspersky anti-virus its customers. The UK and US also blamed North Korea for the devastating WannaCry attacks in 2017. Another interesting stat from the Carbon Black Global Threat Report that caught the eye, was 2018 saw an approximate $1.8 billion worth of cryptocurrency-thefts, which underlines the cyber-criminal threat still remains larger than ever within the threat landscape.